The L-Tek FF1705 platform is based on the low cost, low power MultiConnect® xDot™ Module from MultiTech, complete with an integrated DAPLink interface, all in an Arduino form factor. The L-Tek FF1705 is a development platform for the MultiConnect® xDot™, an ARM® mbed™ programmable, low-power RF module, that provides long-range, low bit rate M2M data connectivity to sensors, industrial equipment and remote appliances. 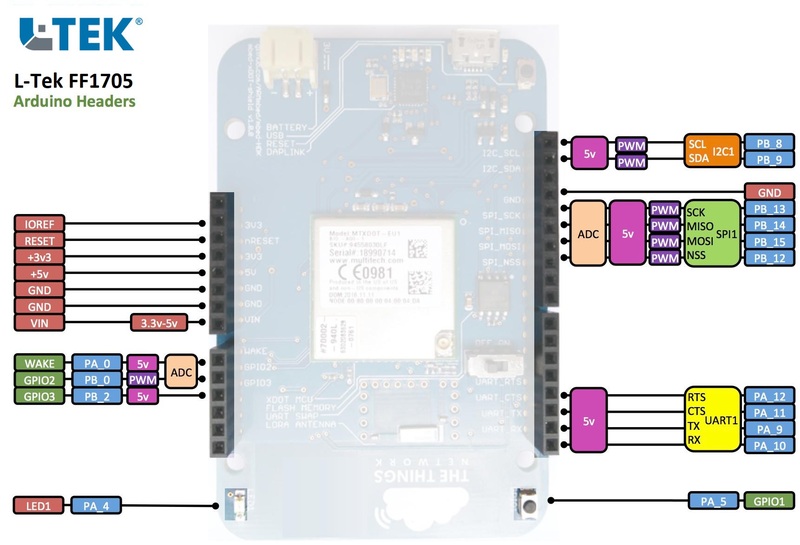 Conveniently integrated with a DAPLink programming and debug interface, and complete with Arduino compatible headers, this platform can be used to prototype applications using a wide range of IO boards and peripherals supported by mbed in the mbed Component library. Additionally, this platform can be used as a shield when fitted to an Arduino form-factor MCU development platform by running the MultiTech AT Command Firmware. See the Factory Firmware section below for more details. The mbed serial driver must be installed on windows PCs before the USB debug serial port from the xDot can be used. It is possible to develop offline for the xDot using mbed-cli and the Eclipse IDE. See wiki page for more information. The pinout diagram above shows the commonly used interfaces and their locations. In addition to their stated functions, all GPIO pins (PA_*, PB_*) can also be used as DigitalIn and DigitalOut interfaces. Due to the processor's architecture, only one pin of the same number (e.g. PA_1 & PB_1) may be configured as an InterruptIn. If multiple pins of the same number are configured as InterruptIn, only the last pin configured will actually trigger an interrupt in the processor. The rest will be ignored. Pin numbers 1, 6, 7, 8, and 13 are internally used as interrupts from the LoRa radio and may not be configured as external interrupts. Doing so will break the LoRa functionality of the xDot and cause undefined behavior. Example: If the WAKE (PA_0) pin is configured to wake the xDot from low power modes, GPIO2 (PB_0) may not be configured as an InterruptIn. Doing so will cause the WAKE pin to not wake the xDot as desired. PwmOut objects using different channels of the same timer must use the same prescaler value. Each timer has a single prescaler which applies to all channels in the timer. If the external voltage on a GPIO is greater than VDD + 0.3V, use of the internal pullup or pulldown resistors could damage the xDot. External pullup or pulldown resistors should be used instead. For more information see the notes below section 6.3.1 of the STM32L151CC Data Sheet. This platform exclusively supports mbed OS version 5. It is compatible with the mbed-os library available to import from https://github.com/armmbed/mbed-os. The use of the mbed 2 SDK "classic" library will result in an error. Most of the APIs are compatible between mbed versions, but please remember to use the right mbed library (mbed-os). Internal pullup and pulldown resistors cannot be used on 5V tolerant GPIO pins when pin voltage is greater than VDD + 0.3V. See warning box above. You can re-program your FF1705 at any time by plugging it in with the button held down. This will cause it to appear as the "CRP DISABLD" drive, at which point you can follow the steps above. The following programs support multiple Dot devices. Before examples or the AT firmware are compiled, a Dot library must be imported. AT command firmware for MultiTech Dot devices. The mbed OS API References contain example code which demonstrates how to use common peripherals like Digital IO, Analog IO, Serial, SPI, I2C, PWM, RTOS, Timers, Tickers, etc. This firmware provides a serial AT command interface for configuring and using the xDot. This firmware is great during development for testing LoRa transmissions and in production when using a separate host processor that controls the xDot via AT commands. It is available here. AT command documentation is available here. 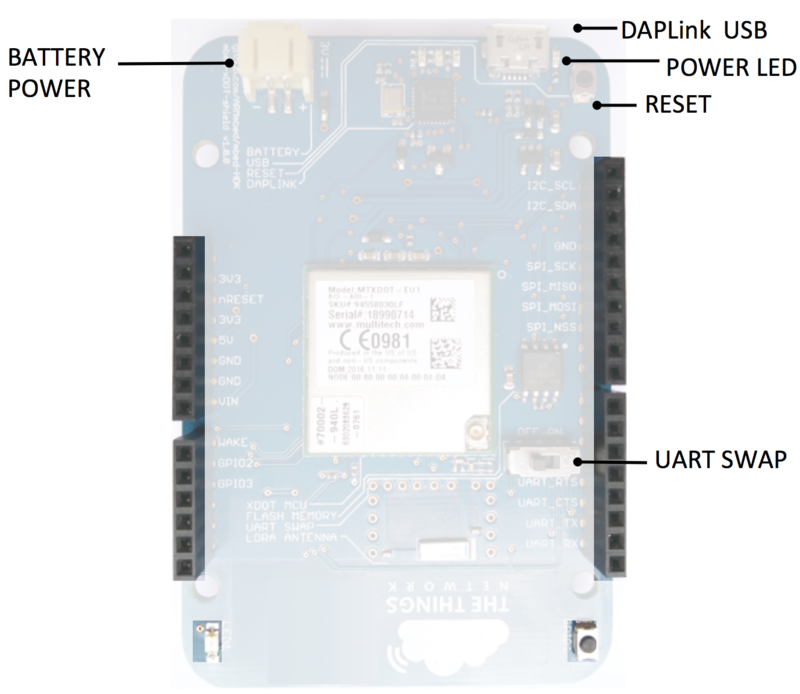 The AT commands must be sent to uart_tx, uart_rx over usb-to-uart adapter. To compile a program for this board using Mbed CLI, use FF1705_L151CC as the target name.